Thin-film filters are the ideal solution for wavelength selection in most optical systems due to exceptionally high transmission at passband wavelengths (close to 100%), very steep spectral edges, and blocking of OD>6 over wide spectral regions for maximum noise suppression. Until recently, the main drawback of thin-film filters is that they are "fixed" filters only, in that changing the spectral characteristics requires swapping filters, thus constraining the size, speed, and flexibility of systems that require dynamic filtering. Diffraction gratings are often used when wavelength tuning is required, but gratings exhibit inadequate spectral discrimination, have limited transmission, are polarization dependent, and are not capable of transmitting a beam carrying a two-dimensional image. 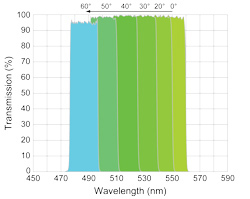 Fluorescence microscopy applications, hyperspectral imaging, high-throughput spectroscopy, and fiber-optic telecommunications systems can all benefit from tunable optical filters. There exist several technologies that combine the two-dimensional imaging performance characteristics of thin-film filters and the center wavelength tuning flexibility of a diffraction grating, including liquid-crystal tunable filters, acousto-optic tunable filters, and linear-variable filters, but none are ideal and all have significant additional limitations. Semrock has developed a revolutionary new optical filter technology: Thin-film filters that are tunable over a wide range of wavelengths by adjusting the angle of incidence. As the diagrams below indicate, it is possible to create bandpass filters with wide tunability, yet essentially no change in spectral performance. The spectrum of any thin-film filter shifts toward shorter wavelengths when the angle of incidence of light upon the filter is increased from 0° (normal incidence) to larger angles. In general, however, the filter spectrum becomes highly distorted at larger angles, and the shift can be significantly different for s- and p-polarized light, leading to a strong polarization dependence at higher angles. 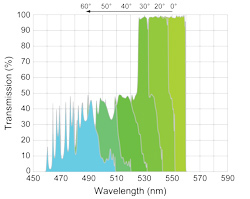 The graph below on the left shows the spectrum of a typical fluorescence filter at six different angles of incidence ranging from 0° to 60°. Note that for angles greater than about 30° transmission for s-polarized light is approximately 0% and the ripple for p-polarized light is intolerably high. More details about the spectral response of filters at high AOI can be found here. In contrast, the spectrum of a Semrock VersaChrome™ bandpass filter (below right) maintains high transmission, steep edges, and excellent out-of-band blocking over the full range of angles from 0 to 60°. Semrock's VersaChrome series of bandpass filters are specified with a tuning range of at least 12% of the filter edge or center wavelength at normal incidence.